An apple pie with raisins and crushed walnuts and seasoned with molasses, inspired by The Ocean at The End of the Lane by Neil Gaiman. New York is a dirty, frustrating, loud place to live. However, every once in a blue moon amazing things happen in this crazy town. For example, you could be riding the E train downtown (a train you very rarely take and never in that direction) only one stop, and you may happen to get on the same train, into the same car, with your favorite author of all time. Talk about cosmic. And that is how I met Neil Gaiman. How do you tell someone that you find their work so inspiring that it makes you want to bake pie? Since our whole conversation is one big, happy blur I can’t rightly remember how I brought them up, but the subjects of my intense admiration and literary pies did arise. Mr. Gaiman recommended that I take a look at The Ocean at the End of the Lane, which already has a pie in it. What luck! What fortuitous happenstance! I immediately went out and bought a copy (which just came out in paperback in June). The book follows an unnamed narrator as he returns to his childhood home after a funeral and finds himself dredging up strange memories. In particular, he recalls the girl who lived at the end of the lane, Lettie Hempstock, her mother Ginnie, her grandmother Old Mrs. Hempstock, and the pond behind their farmhouse Lettie called her “ocean.” When a local suicide brought a sinister, supernatural force into the narrator’s home and family, only the Hempstock women had any inkling of how to handle it. The beautiful thing about fantasy is that it allows the reader (and the author, I would imagine) to process and tackle very real problems from a different angle. The central focus is magic, mischief, and mayhem, but you’re always looking at something real slant-ways out of the corner of your eye. Dealing with the often senseless and overwhelming aspects of life becomes a bit more bearable when a particular narrative-based order is applied to them. You can know things will turn out in a certain way in a work of fantasy based on the laws that govern all stories of its ilk. The Ocean at the End of the Lane deals a lot with pretense, with the idea that what exists on the surface is a facade and that we all contain hidden, often darker depths. It manifests as the idea that there is a thin layer of shining brightness that hides the darkness; a fragility to the nice stories we spin for ourselves behind which lurks something ugly, insecure, or truthful. The pretense and the truth are neither good nor bad, but both are necessary. My favorite example of this is that all adults are still the same frightened children they have always been on the inside (something I think any struggling twenty-something will agree with). Initially when I was reading this book I considered a hearty meat pie to evoke the homey feeling of the Hempstocks’ kitchen. As a baker and secret seven-year-old playacting at adulthood, a clean, bright, well-used kitchen sounds like absolute paradise. But it’s true, there is, in fact, a pie in this novel already! Moreover, the apple pie with raisins and crushed nuts (served with the sweetest vanilla custard ever to grace the narrator’s tongue) is a frustratingly apt pie to represent this book as a whole. Perhaps I find it frustrating because I’m not sure it’s a pie I would have thought of myself. On the one hand I’m wary of just baking something straight from the book; it feels like the pie of least resistance. (Mostly because I’m a masochist and a perfectionist and enjoy making things difficult for myself.) But, on the other, I thought that personalizing a pie with pre-existing guidelines might be a fun new challenge. The symbolism would have to be in the seasoning. Ultimately, I made three decisions on that front. The first is that I chose walnuts for the crushed nuts in the filling. The second (and slightly more substantial) decision was to add molasses to the filling. Molasses is a distinct and strong flavor, but I wanted to give the impression that beneath a layer of bright, flaky, sugary crust there was something a little odd; dark, bitter, sweet, unusual, and complex. (Similarly, I also used black raisins as opposed to gold to achieve that aesthetic.) And finally I did a bit of storybook math with the various measurements. you see a lot of the numbers three and seven in fairy tales, they’re part of that system of fantastic order; if the hero faces two challenges in his quest, you can bet there will be a third. They’re numbers with magical value, and so I chose measurements for various ingredients that reflect those numbers. *I didn’t add cornstarch but I should have, the filling came out with more liquid than I usually like and so to gel the filling I would recommend adding this as a thickener. I tried my hand at making the world’s sweetest custard as well, but did not have the thermometer or the fine mesh sieve to get it done properly. If you want to give it a shot, the recipe I used can be found at Epicurious! In a large mixing bowl combine the flour, butter, water, and vinegar. Combine the ingredients using clean hands or a pastry cutter until they come together in a shaggy but cohesive clump. (Per usual, you want the dough to be striated with uncompromised veins of butter.) Wrap the ball in saran or cling wrap and refrigerate until ready for use. Peel and slice all seven apples. In a second large mixing bowl combine the apple slices, light brown sugar, sugar, molasses, walnuts, raisins, cinnamon, nutmeg, and cornstarch. It’s actually that simple. You throw it all in the bowl and then turn it using a spatula, spoon, or (clean) hand until everything is evenly coated. Separate the clump of dough into two equal pieces. Flour your work surface and rolling pin and roll out the first half to line the pie plate. Pour the apple goo into the bottom crust, roll out the second lump of dough, and lay it over top. Press the edges of the top and bottom crust together, curling them in towards the center of the pie and pinch to seal. Beat the egg in a small bowl (I use a fork to get the job done) and brush a light layer of egg over the top crust. Sprinkle with sugar and ventilate by strategically piercing the pie with a sharp knife. Bake for 45-60 minutes or until golden brown! 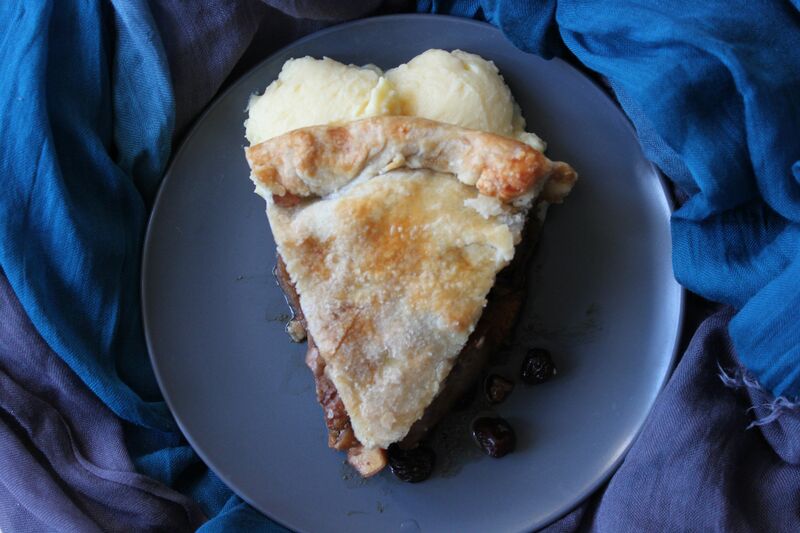 This pie came out very heady and fragrant, perfect to serve on a cold, wet, rainy day as you warm your toes and dry out puddle-soaked socks by a kitchen fire. “The symbolism would have to be in the seasoning.” — SHIVERS! What a writer. I baked this recipe for my family and it was gone by morning. The walnuts especially met with approval.